One never knows which beginning to craft. Is it the ‘Once upon a time’ that really gets the tale beginning or is the real kicker the ‘A long time ago in a galaxy far, far away?’ Each is ready to tell a pretty spectacular tale but, like they say, beginnings are pretty tough! Then again, it looks like you’ve got a good idea of the look that you’d like to pull off for your tale. You’ve got your costume arranged. Wizard in regal and elegant robes? Prince gone gallivanting with your loyal subjects? Lightsaber toting Jedi Master, perhaps? Well, once you’ve crafted your perfect beginning and know what kind of mark you’ll leave for the bulk of your adventure, you need to be sure you have all the details put together. The ending, of course, is the soul of the story and when it comes to the realm of costuming, that means the sole! 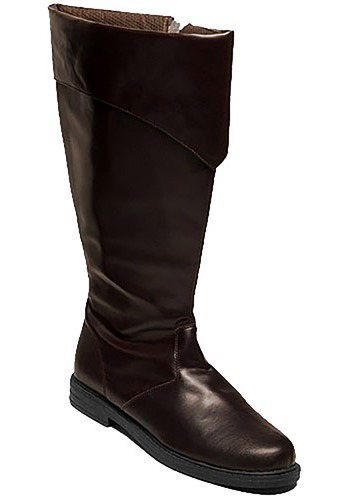 Be sure that you have your story properly completed with these Tall Brown Costume Boots. The textured anti-skid soles will keep you upright while the keen brown faux leather keeps you stylish. The wide turned-down cuff at the top edge gives you just the nuanced detail you need to ensure you land the spot at the top of the Jedi Council or the peaks of the High Wizard Enclave! The fit was close, just need some thick socks. They're sturdy, and quite honestly a great buy for the money.